Endodontically treated teeth are often colored, brittle and subjected to fracture conducting to serious aesthetic and mechanical problems which are strongly related to endodontic procedures and vitality loss. Its treatment remains a challenge confusing issues for the clinician and is, most of the time, associated with the use of posts in order to sufficiently replace missing coronal tooth structure and to provide adequate retention for the crown. This post will distribute occlusal stress along the remaining interface with the tooth structure. 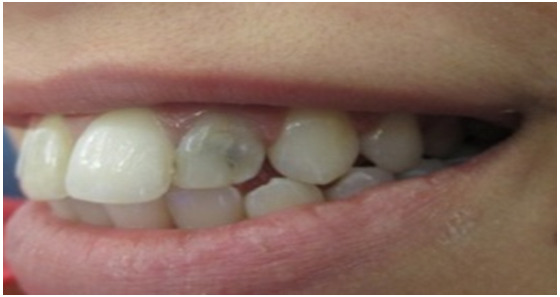 Practitioner decision regarding the selection of materials and restorative techniques are made difficult by the large number of exciting options. Recently, the increasing use of ceramics for fixed prosthodontics suggests the use of non-metal posts. In fact it prevents the grayish appearance of the marginal gingiva that can occur due to unfavorable light reflection from a dark post. For that, the use of metal free systems is highly recommended in the aesthetic zone. In addition to its biocompatibility, it allows the preservation of maximum coronal and root structure. More than fulfilling aesthetic requirements they have, also, been introduced with the proclamation of avoiding root fractures due to a modulus of elasticity close to that of dentin. In fact, posts and resin based materials can behave as a mechanically homogeneous complex with dentin[5,6]. Moreover, setting of a fiber –reinforced post and fabrication of its core with composite resin are done in a single appointment. Allying free metal post and core system with an all ceramic restoration achieves a high aesthetic level avoiding dark areas under crowns and avoids also productions corrosion from occurring. Post bonding and composite core building up require perfect control of conditioning which conducts to a proper bond between the tooth and the composite material. When a post and core build up is not necessary, achieving an aesthetic result in endodontically treated teeth require a ceramic material that masks the underlying abutment tooth color caused by intrinsic discoloration. In this context, Zirconia seems to be the suitable material because of its high refractive index. In fact, it does not allow light transmission through the abutment tooth avoiding in that order discoloration and gingiva shadowing from occurring[4,7,8]. 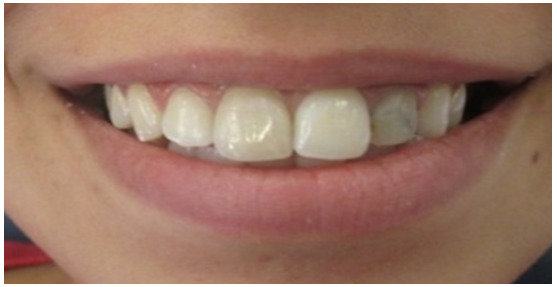 A-25-year old female patient presented to the department of fixed prosthodontics. She had a hidden smile and was complaining about her poor aesthetics due to discoloration of her incisors. 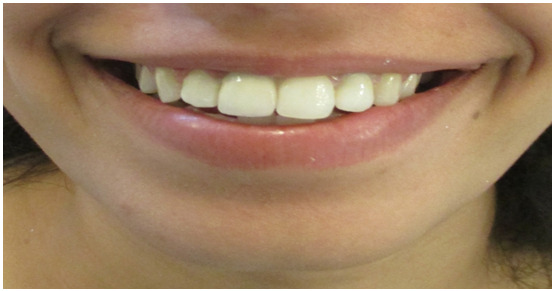 She expressed her dissatisfaction with the impaired aesthetic appearance caused by affected teeth and she was asking for improvement of her smile [Figure 1,2]. She noticed that the change in color was increased gradually. 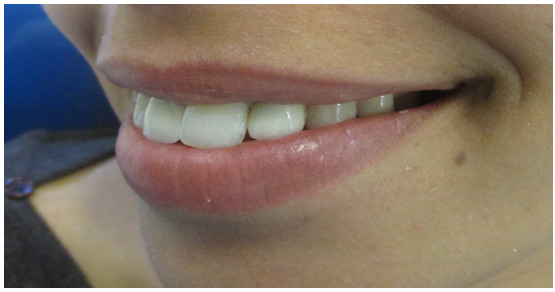 Intra oral examination showed dark central and lateral incisors. 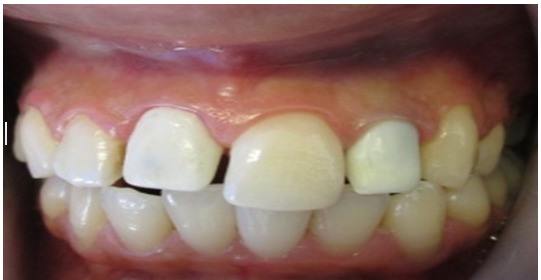 The lateral incisor was severely damaged and restored with resin material. A comprehensive examination revealed that both the incisors (11 and 22) were non vital and they were endodontically treated. 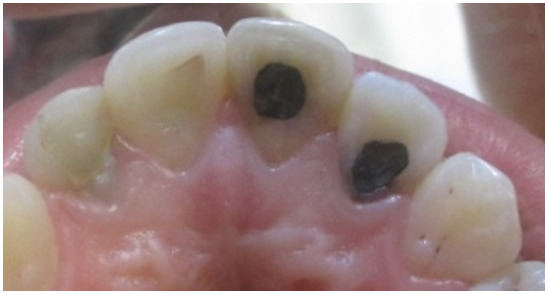 The palatinal surfaces of right incisors (11 and 12) were filled with amalgam material [Figure 3]. Radiological evaluation confirmed that the 11 and 22 were non vital. It showed, also, that the lateral incisor (22) was restored using a metallic threaded post associated with a resin material. 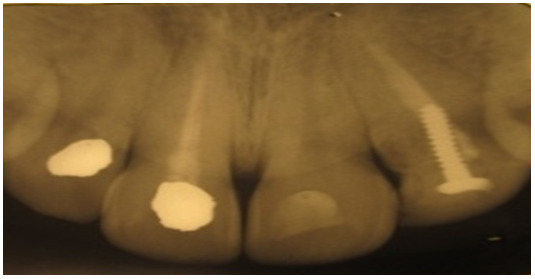 Moreover, unsuitable endodontic fillings were detected [Figure 4]. Aesthetic assessment showed a squared teeth form. Soft tissues were evaluated as healthy with a wide band of attached gingiva in the maxillary region and a good oral hygiene. No size discrepancy was detected. Gingival symmetry was also noted [Figure 5]. To meet aesthetic goals, the treatment plan included endodontic re-treatment; a post andcore build up on the lateral incisor followed by Zirconia based crowns. The metallic threaded post was removed and an endodontic retreatment was performed using the lateral condensation technique. The sound remaining hard tissues on the lateral incisor were evaluated as supra gingivally located [Figure 6]. A post and core build up was performed on the lateral incisor using a fiber reinforced post. First, the gutta percha was partly removed (about 2/3th of this material) leaving the apical 4 mm of the fillings to maintain a good seal. The root was prepared with the suitable drill. The post was then selected and bonded. Finally the core was built up using composite resin via the incremental technique. The teeth were prepared for all ceramic crowns with internal rounded shoulder at a sub gingival level. 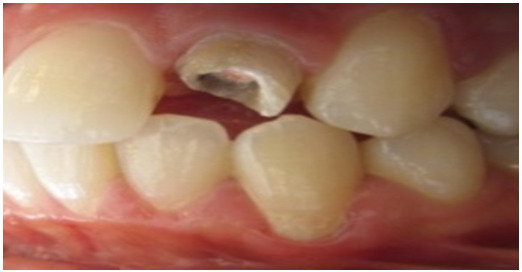 Tooth preparation edges presented no sharp angles not to create internal stress in the crown [Figure 7]. Provisional restorations were fabricated using auto-polymerized resin TEXTON (S .S White, made in England by Prima Dental Group) and cemented with temporary cement (Temp Bond Type I Class 1.Kerr made in Italy). The full arch impression was made using a silicone material (HydroC, Detax made in Germany. The retraction of the gingiva was performed using a retraction cord. The shade was determined with a shade guide (Vitapan 3D Master). 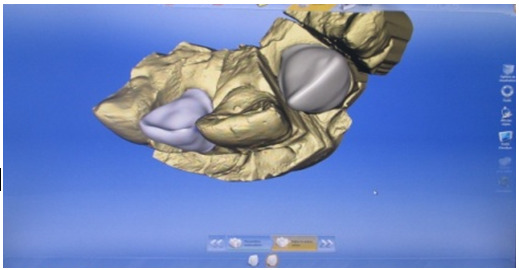 About a week after this procedure; the cores were fabricated with Zirconia via CEREC IN LAB using pre-shaded Zirconia blocks [Figure 8], and tried in [Figure 9]. The thickness of the cores was recorded using a pair of tactile compasses; it was 0.6mm. Afterwards, the cores were veneered with a compatible porcelain system with a thickness between 1 mm to 2 mm. After the removal of temporary restoration, the abutment teeth were cleaned with chlorhexidine and the final restorations were cemented using Zinc phosphate cement. The tooth shade was in harmony with the surrounding dentition and soft tissues [Figure 10]. 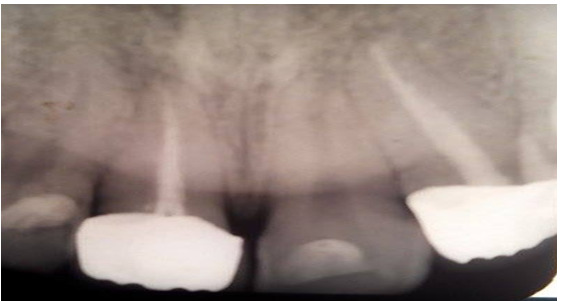 Radiographic reevaluation, after cementation, shows a well done endodontic retreatment with suitable root fillings. It shows also an acceptable marginal fit [Figure 11]. The patient was, also, satisfied with the result, [Figure 12-14]. Authors demonstrated that endodontically treated teeth exhibit a significantly shorter service life compared with vital teeth and are usually associated with extensive loss of tooth structure due to caries, trauma, or further endodontic treatment[9,10]. This fact is related to the decrease of structural integrity of the tooth because of tissues removing during endodontic access and extensive carious process. 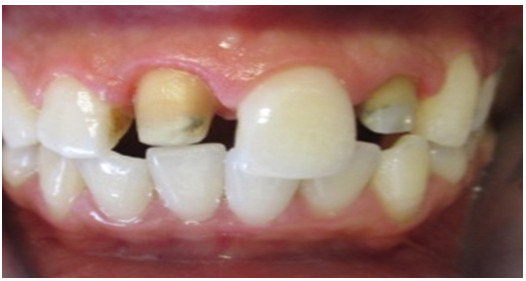 Metal posts are commonly used to improve the retention of crowns on non-vital teeth. However, recent investigations proved that root fracture risk is important with these posts. This arises from the fact that there is a difference between the elastic modulus of dentin and post material source of stress for the root structure. According to recent studies which focused on cyclic loading of incisors restored with different posts, metal posts demonstrated higher fatigue resistance than fiber reinforced composite or Zirconia posts. In fact, the metal post which is more rigid resists the forces and transfers the stress to the tooth structure. Moreover, opaque metal post and cores can shine through translucent ceramic or lead to discoloration and shadowing of the gingiva and a grayish color in the cervical area of the tooth. The increasing need for metal free posts was then a logical consequence that can solve the aesthetic problem combined with improved mechanical properties. They resist on occclusal stress and have light transmission similar to natural tooth. They also allow us to restore the tooth with minimal tooth structure removal[13,14]. As shown, this post and cores system requires sound hard tissues supra gingivally placed which is necessary for a successful secure bonding. The success of a restoration using a fiber post is, also, related to the quality of bonding interface between the post and the tooth structure. In fact, improper bonding conducts to increased stress to occlusal loading leading to failure of post retained restoration. According to authors, Bonding between resin cement and fiber post can be improved by chemical and micromechanical means. As post is covered by epoxy resin which has a high degree of conversion, agents that dissolve only epoxy matrix, without interfering with fiber integrity were used. They include hydrogen peroxide, potassium permanganate and sodium ethoxide. A recent study concluded that a high bond strength values were noted in 15s etched phosphoric acid group and 60s etched hydrogen peroxide group with no significant difference between the 2 groups. Moreover, surface topography showed no damage to its structural integrity with complete epoxy layer removal[5, 15, 16]. Intrinsic discoloration of devitalized teeth needs an opaque material which makes the use of silica glass based all ceramics rejected as it is translucent .This fact justifies the use of Zirconia, which has a low translucency, as single restorations in such cases. This material does not allow light transmission through the abutment tooth and it masks its intrinsic coloration similarly to metal frameworks which makes it highly recommended in discolored teeth[4,16]. Moreover, Due to the improved mechanical properties of the material; some systems, such as CEREC system, allow to thin the cores to O.2 mm on the facial aspect permitting more space for porcelain veneering and then a maximum translucency which is necessary for incisors. However, a clinical problem with Zirconia is the difficulty in achieving suitable adhesion with intended synthetic substrates or natural tissues. Traditional adhesive techniques used with silica based ceramics do not work effectively with Zirconia. For that, Zirconia bonding is still questionable. In fact, increasing the crystalline content and decreasing the glass content, result in acid resistant ceramic whereby any type of acid treatment produces insufficient surface changes for adequate bonding resin. The application of a trobochemical silica coating may a solution for Zirconia bonding. It is, also, important to remember that Zirconia crowns can also be cemented with conventional cements if adequate crown preparation design provides sufficient retention without bonding[17,18]. Compared to other alternative techniques, the use of a fiber post and resin composite offers several advantages. It provides immediate esthetic rehabilitation of the damaged tooth with improved mechanical properties. Allying free metal post and core system with an all ceramic restoration achieves a high aesthetic level avoiding dark areas under the prosthesis which can be produced by the use of a non-aesthetic post and core system. Laboratory technician collaboration is also a key of success of aesthetic restorations. Acknowledgement: The authors would like to thank colleagues from the department of fixed prosthodontics for their support. We would like, also, to thank the laboratory technician Mr Fathi Troudi for his valuable efforts. 1. Dietschi, D., Duc, O., Krejci, I., et al. Biomechanical considerations for the restoration of endodontically treated teeth: A systematic review of the literature –part 1; Composition and micro- and macrostructure alterations. (2007) QuintescenceInt 38(9): 733- 743. 2. S. Joshi, S., Mukherjee, A., Kheur, M., et al. Mechanical performance of endodontically treated teeth. (2001) Finite in analysis and design 37: 587- 601. 3. Stephan, J.P. Nonmetal posts: How do they fare in daily dentistry? QDT 2008. 4. Dalenda, H., Nissaf, D., Zohra. N., et al. 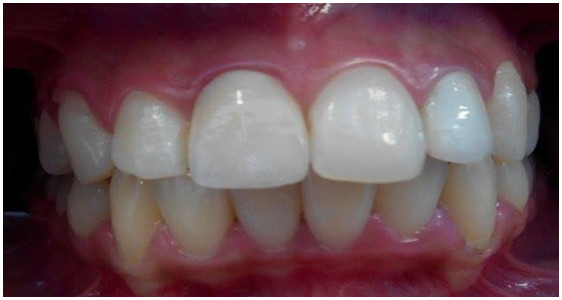 Gingival Harmony in Anterior Aesthetic Restorations. (2014) Dentistry Journal 2(4): 155- 162. 5. Chandrakanth. M., Chandrasekhar. V., Pradeep. K. M., A simplified etching technique to improve the adhesion of fiber post. (2014) J AdvProsthodont 6(4): 295- 301. 6. Young-Hoi Kim., Jong-Hyuk, Lee. Influence of modification in core building procedure on fracture strength and failure patterns of premolars restored with fiber post and composite core. (2012) J AdvProsthodont 4(1): 37- 42. 7. Min-Chieh Liu., Aquilino, S. A., Gratton, D. G., et al. Relative translucency and surface Roughness of four Yttrium-stabilized Tetragonal Zirconia Polycrystalline based dental restorations. (2013) Journal of experimental and clinical medicine 5(1): 22- 24. 8. Kelly, J. R., Nishimura, I., Campbell, S. D. Ceramics in dentistry: historical roots and current perspectives. (1996) J Prosthet Dent 75(1): 18- 32. 9. Tan, P. L., Aquilino, S. A., Gratton, D. G., et al. In vitro fracture resistance of endodontically treated central incisors with varying ferrule heights and configurations. (2005) J Prosthet Dent 93(4): 331- 336. 10. Al Hamad, K. Q., Al-Omari,F. A., Al Hyiasat, A. S.The tapered of cast post preparation measured using innovative image processing technique. (2010) BMC Oral Health 10: 19. 11. Hedlund, S. O., Johansson, N. G., Sjögren, G. Retention of prefabricated and individually cast root posts canal posts in vitro. (2003) Br Dent J 195(3): 155- 158. 12. Andreas. R. Dominik, M. Cyclic loading of incisors restored with different post systems. (2014) Oral Hyg Health 2: 148. 13. Heydecke, G., Peters, M. C.The restoration of endodontically treated single rooted teeth with cast or direct posts and cores: A systemic review. (2002) J Prosthet Dent 87: 380- 386. 14. Ujiwal. D., Saswati. 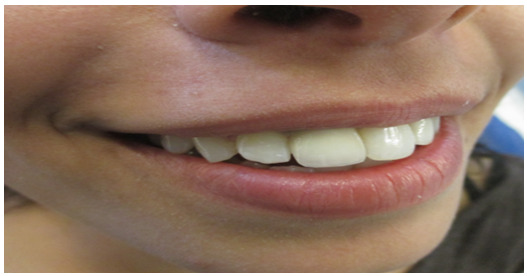 M. D., Dibyendu, M. Endo esthetics- Rehabilitation of a complicated restorative case-Case report. (2014) International Journal of Research Dentistry 4(2): 69- 74. 15. AlinePinheiro. M., Maximiliano. S. C., Rafaef, M. R.,et al. Current concepts on the use and adhesive bonding of glass-fiber posts in dentistry: a review. (2013) Applied adhesion Science 1: 4-13. 16. Nissaf.D, Dalenda. H, Jilani. S, et al. 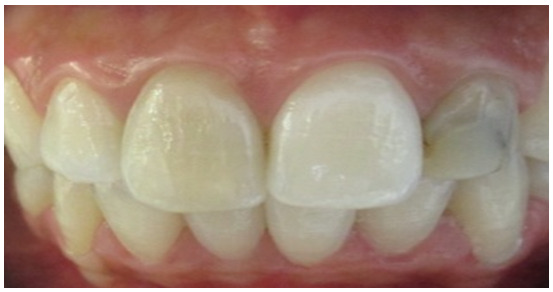 Esthetic Rehabilitation with Zirconia Based Crowns. (2015) International Journal of Medical and Pharmaceutical Case Reports 3(3): 73-79. 17. Dbradovi?-Djurici?, K., Medi?, V., Dodi?, S., et al. Dilemmas in Zirconia Bonding: A review. (2013) SrpArhCelok 141(5- 6): 395- 401. 18. Thompson, J. Y., Stoner, B. R., Piascik, J. R., et al. Adhesion/cementation to Zirconia and other non silicate ceramics: Where are we now? Denl mater 27(1): 71- 82.